without the need for wired connections. Let us take a look at how to connect wireless printer to laptop and computers. Step 1: Place the printer within range of your wireless router. 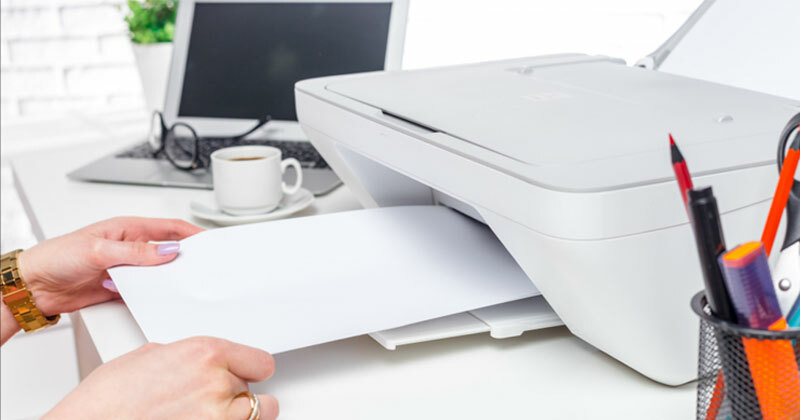 Most modern printers have Wi-Fi capability so you can use them without connecting them to a computer or laptop with cables. Make sure it is within range of the router to ensure signal coverage. Step 2: Switch on the printer. The printer needs to be on and connected to the network first. Only then can you connect to the system. Setup of a Wireless printer Connection. 1. This process for this will vary based on the printer you use. You will need to know your Wi-Fi network name (SSID) and password. 2. Connecting wireless printer using the built-in menu system is the most recommended option. Refer to the printer manual for finding this. If not, visit the website of your printer’s manufacturer and download a copy of the manual as PDF. 3. If your printer and router both support WPS push-to-connect, the procedure is simple. Push the WPS button on your printer and then press the WPS button on your router quickly. The connection will be made automatically within 2 minutes. cable, and use the included software to set up the printer wireless connection. After configuring the wireless settings, you can disconnect it from your computer. Add the printer on your Windows computer or laptop. 1. After connecting the printer to your network, you can add it to your Windows computer or laptop so that you can print to it. To do so, follow the below steps. If you are using Mac goto step 5. 2. Open the Control Panel from the Start menu (if you are using windows 7 or earlier) or by right-clicking the Windows button (if you are using Windows 8 and later). Now, Select View devices and printers or Devices and Printers. 3. Click the Add a printer button and select your printer from the list. 4. Install any drivers if prompted. This may not be necessary in most cases. by checking it’s model number on the internet. 2. After that Click the Apple menu and select System Preferences. 3. Now, Click the Print Scan button. 4. Click the + symbol to add a new printer. 5. Select your printer from the list and follow the prompts to install any necessary software. Once your printer has been added successfully, you can select it and use it to take printouts. Your new printer will appear in the Printer selection menu when you go to print option for your document or photo. If the printer isn’t available on the menu, make sure that both the printer and computer is connected to the same network. If it is still not there, try restarting your printer and it will appear again.